طباطبائیان, مریم, عباسعلی زاده رضاکلائی, ساناز, فیاض, ریما. (1395). بررسی تأثیر طبیعت بر خلاقیت کودک. معماری و شهرسازی آرمان شهر, 9(17), 91-102. مریم طباطبائیان; ساناز عباسعلی زاده رضاکلائی; ریما فیاض. "بررسی تأثیر طبیعت بر خلاقیت کودک". معماری و شهرسازی آرمان شهر, 9, 17, 1395, 91-102. طباطبائیان, مریم, عباسعلی زاده رضاکلائی, ساناز, فیاض, ریما. (1395). 'بررسی تأثیر طبیعت بر خلاقیت کودک', معماری و شهرسازی آرمان شهر, 9(17), pp. 91-102. طباطبائیان, مریم, عباسعلی زاده رضاکلائی, ساناز, فیاض, ریما. بررسی تأثیر طبیعت بر خلاقیت کودک. معماری و شهرسازی آرمان شهر, 1395; 9(17): 91-102. 1استادیار معماری، دانشکده معماری و شهرسازی، دانشگاه هنر، تهران، ایران. 2کارشناس ارشد معماری، دانشکده معماری و شهرسازی، دانشگاه هنر، تهران، ایران. 3دانشیار معماری، دانشکده معماری و شهرسازی، دانشگاه هنر، تهران، ایران. تأثیر محیط های طبیعی بر ذهن و روان کودکان، از مهم ترین مسائلی است که توجه محققان را به خود جلب کرده است. به خصوص با افزایش شهرها و صنعتی شدن جهان این محیط ها و ویژگی هایشان بیش از پیش مورد توجه روانشناسان به عنوان عاملی مؤثر در جهت شکل گیری شخصیت کودک و افزایش سلامت جسمی و روحی او قرار گرفته است. در این راستا می توان به تأثیری که طبیعت و ویژگی های آن بر شکوفایی خلاقیت کودک دارد، اشاره کرد.هدف از مطالعه حاضر مروری است بر شناخت ویژگی های محیط های طبیعی که بر خلاقیت کودک موثر می باشند و بهره گیری از آن ها به عنوان الگو در جهت طراحی محیط های ساخته شده برای کودکان؛ با طرح این پرسش که راهکارهای طراحی در محیط های ساخته شده برای کودکان به منظور شکوفایی خلاقیت آن ها با الگوبرداری از ویژگی های محیط های طبیعی چیست؟ در این نوشتار با استفاده از روش تحقیق کیفی و تحلیلی، به بررسی پژوهش های انجام شده در این زمینه و مقایسه نظریه های مرتبط و یافتن ارتباط میان آن ها در حیطه های روان شناسی محیط و طراحی معماری پرداخته شده است. نتایج به دست آمده نشان می دهد، محیط های طبیعی با داشتن ویژگی هایی ساختاری چون انسجام، خوانایی، رمز و راز و پیچیدگی که بر روان کودک مؤثر است و نیز خصوصیاتی چون تنوع، تغییر، تحرک، چشم انداز، مسیر و غیره می توانند بستر مناسبی را جهت رشد و پرورش خلاقیت کودکان فراهم آورند. همچنین بر اساس این ویژگی ها می توان راهکارهایی را در طراحی محیط های انسان ساخت برای کودکان درجهت شکوفایی خلاقیت آن ها ارائه داد. Aziz, N. & Said, I. (2012). The Trends and Influential Factors of Children’s Use of Outdoor Environments: A Review. Journal of Social and Behavioral Sciences, 38, 204 – 212. Balling, J.D. & Falk, J.H. (1982). Development of Visual Preference for Natural Environments. Journal of Environment and Behavior, 4(1), 5-28. Bell, P.A., Greene, T.C., Fisher, J.D. & Baum, A. (2001). Environmental Psychology. London: Lawrence Erlbaum Associates Press. Craft, A. (2002). Creativity and Early Years Education a Life Wide Foundation. New York: Continuum Press. Evans, G. W. (2003). The Built Environment and Mental Health. Journal of Urban Health: Bulletin of the New York Academy of Medicine, 80(4), 536-555. Evans, G. W. & McCoy, J. M. (1998). When Buildings Don’t Work: The Role of Architecture in Human Health. Journal of Environmental Physiology, 18, 85-94. Frumkin, H. & Fox, J. (2011). Contact with Nature. In A. L. Dannenberg, H., Frumkin, R. J. Jackson (Eds), Making Healthy Places: Designing and Building for Health, Well-being, and Sustainability (pp. 106- 228). Washington: Island Press. Greenbie, B. B. (1982). The Landscape of Social Symbols. Landscape Research, 7, 2- 6. Hagan, S. (2012). Taking Shape: A New Contract between Architecture and Nature, NewYork: Routledge Press. Hartig, T. & Evans, G. W. (1993). Psychological Foundation of Nature Experience. In T. Garling & R. G. Golledge (Eds), Behavior and Environment: Psychological and Geographical Approaches (pp.427- 457). Amsterdam: North Holland Press. Hartig, T., Evans, G.W., Jamner, L.D., Davis, D.S., Garling, T. (2003). Tracking Restoration in Natural and Urban Field Settings, Journal of Environmental Psychology, 23, 109-123. Heft, H. (1997). The Relevance of Gibson’s Ecological Approach to Perception for Environment-Behavior Studies. In G. T. Moore & R. W. Marans (Eds), Toward the Integration of Theory, Methods, Research, and Utilization, Advances in Environment, Behavior and Design (vol.4, pp.71-108). Berlin: Springer Science & Business Media Press. Heerwagen, J. H. & Orians, G. H. (1993). Humans Habitats, and Aesthetics. In S. R. Kellert & E. O. Wilson (Eds), The Biophilia Hypothesis (pp.138-172). Washington DC: Island Press. Hietanen, J. K. & Korpela, K. M. (2004). Do Both Negative and Positive Environmental Scenes Elicit Rapid Affective Processing? Journal of Environment and Behavior, 36, 558- 577. Hosseini, A. (2009). Understanding the Nature of Creativity and its Farming Methods. Mashhad: Beh Nashr, Astane Ghodse Razavi Press. Izadpanah Jahromi, A. (2004). Child, Play, City, Process and Criteria of Planning and Designing Play Areas for Children. Tehran: Publication of Organization of Municipalities Press. Joye, Y. (2007). Architectural Lessons from Environmental Psychology: The Case of Biophilic Architecture, Journal of Review of General Psychology, 11(4), 305-328. Kaplan, S. (1987). Aesthetics, affect and cognition. Journal of Environment and Behavior, 9, 3-32. Kaplan, S. (1988). Perception and landscape: Conceptions and Misconceptions. In J. Nasar (Eds), Environmental Aesthetic: Theory, Research, and Applications (pp.45-55). Cambridge, England: Cambridge University Press. (Eds), Encyclopedia of Creativity (vol. 1, pp.597-606). San Diego: Academic Press. Lang, J. T. (2004). Creating Architectural Theory: The Role of the Behavioral Sciences in Environmental Design. NewYork: Van Nostrand Reinhold Press. Lynch, K. (1960). The Image of the City. Cambridge, MA: M.I.T. Press. Maas, J., Spreeuwenberg, P., Winsum-Westra M. V., Verheij, R.A., Vries, S., Groenewegen, P.P. (2009). Is Green Space in the Living Environment Associated with People’s Feelings of Social Safety? Journal of Environment and Planning A, 41(7), 1763-1777. McAndrew, F.T. (2008). Environmental Psychology. United States: Brooks/Cole Press. Moore, R.C. & Marcus, C.C. (2008). Healthy Planet, Healthy Children: Designing Nature into Daily Spaces of Childhood. In S. R. Kellert & J.H. Heerwagen & M.L. Mador (Eds), Biophilic Design, The Theory, Science, and Practice of Bringing Buildings to Life (pp.153-203). NewYork: John Wiley & Sons Press. Mozafar, F., Hoseini, B., Bagheri, M. & Azemati, H. (2007). The Role of Neighborhood Open Spaces in Children’s Growth and Creativity. 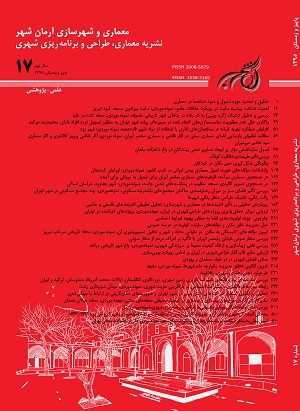 Bagh-E–Nazar Journal, 4(8), 59-72. Noghrehkar, A.H., Mozaffar, F., Saleh, B. & Shafaee, M. (2009). Designing Kindergarten Setting based on the Relationship between Creativity Characters and Some Architectural Ideas. Educational Innovations Journal, 8(32), 39-59. Pope, R. (2005). Creativity: Theory, History, Practice. NewYork: Routledge Press. Pourjafar, M., Ansari, M., Hadi, M., Alizadeh, A. (2010). Analyze Study of Children’s Creativity Incentives in Urban Spaces and Environment’s Design with Emphasis on Bringing up Cohesions between Creativity and Physical Design of Urban Spaces. Journal of Urban Management, 25(8), 63-82. Shafaee, M. & Madani, R. (2010). Design Principles of Educational Facilities for Children based on the Child’s Creativity. Journal of Technology of Education, 4(3), 215-222. Sommer, R. & Summit, J. (1995). An Exploratory Study of Preferred Tree Form. Journal of Environment and Behavior, 27, 540- 557. Staempfli, B. M. (2009). Reintroducing Adventure into Children’s Outdoor Play Environments. Journal of Environment and Behavior, 41 (2), 268-280. Summit, J. & Sommer, R. (1999). Further Studies of Preferred Tree Shapes. Journal of Environment and Behavior, 31, 550- 576. Tabatabaian, M. (2004). Test Construction for Assessment of Teachers’ Attitudes toward Creativity. Iraninan Psychiatry and Clinical Psychology Journal, 10(1), 100-109. Tai, L., Haque, M., K.McLellan, G., Knight, E. (2006). DESIGNING Outdoor Environments for Children. NewYork: McGRAW-HILL Press. Ulrich, R. S. (1983). Aesthetic and Affective Response to Natural Environment. In I. Altman & J. F. Wohlwill (Eds), Human Behavior and Environment. (Vol. 6, pp.85-125). NewYork: Plenum Press. Wan, A. & Zulkiflee, A. S. (2012). A Pilot Study: The Impact of Outdoor Play Spaces on Kindergarten Children. Journal of Social and Behavioral Sciences, 38, 275 – 283. Wells, N.M. & Evans, G.W. (2003). Nearby Nature: A Buffer of Life Stress among Rural Children. Journal of Environment and Behavior, 35, 311-330.